and I’ve had time to check it out. I think many of us have been there: you can’t figure out how to work the microwave, so you just hit something like a four-minute popcorn button, and then stop it manually when it gets to the minute thirty you really wanted. Well, Amazon really has fixed all that! You get this microwave…it’s a decent microwave: 700 watts, .7 cubic feet (about 20 liters), with a turntable. You connect the microwave (wirelessly) to an Echo device using the Alexa app (probably on your phone…I’m using a Galaxy S8). 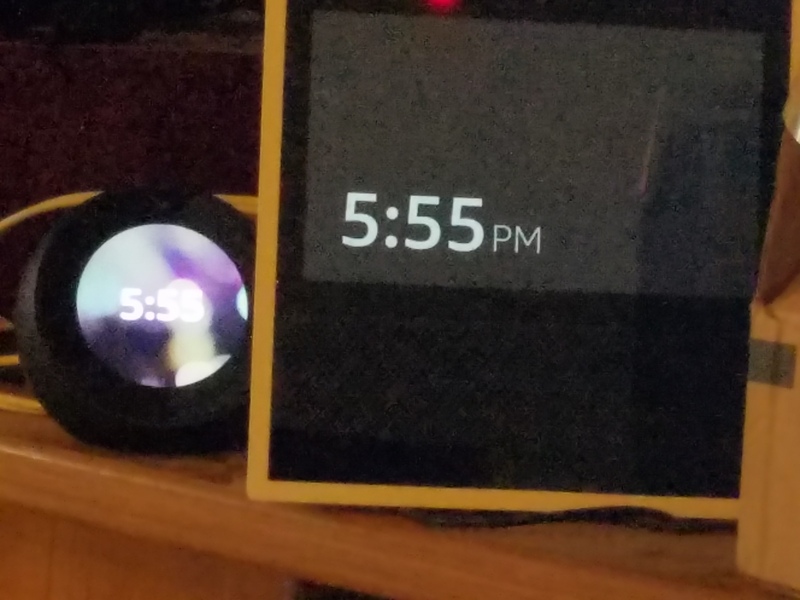 From then on, you can just tell Alexa how much time you want, and it happens! Is this life changing? No. Is it nice? You bet your baked potato! One of the things it solves is having to clean the buttons on the microwave…that’s one of the reasons why we wanted to replace our old microwave, the buttons were wearing out (the numbers become illegible). Oh, and that’s definitely worth noting! It does have buttons. My Significant Other is not a big fan of tech, although my SO has been using Alexa more lately**. Having buttons as an option is definitely a good thing. In fact, this is my one suggestion for Amazon so far: I’d like to have a way to pop the door open (and ideally, also close it, but I know the latter would be harder for the device and easier for me) by voice. Then, I wouldn’t have to touch the front surface at all if I didn’t want to do that. There is one sort of odd button you might want to use, though…and I misunderstood it at first. and they are right near each other. I’m sure they’ll be adding more…and I guess that gives me my second suggestion for Amazon. 😉 We should be able to tell it an amount to cook something and have it remember it. “Echo, remember that I cook MorningStar Farms Breakfast Patties for one minute and 25 seconds”, and then later, I could say, “Echo, cook breakfast patties”, and it would do it. Anyway, that button…there is an “Ask Alexa” button near the keypad. I thought (without having thought about it much) that it would mean that I could talk to the microwave instead of the Echo Show, but the microwave doesn’t have microphones as far as I know. What it does is replace saying the wake word…instead of saying, “Echo microwave for 90 seconds”, you can just push the button and say, “90 seconds”. That might seem silly, but here’s the thing: my Echo Show could do a lot of things for ninety seconds, like setting a timer, so I have to specify. When I push the Ask Alexa button on the microwave, it knows I’m talking about the microwave. I don’t have to tell it to cook…it already knows that’s what I want. I also think that’s why the microwave doesn’t do the regular Alexa things, like telling me the weather or what time*** it is…it has to be paired with an Echo device, so you already have that functionality. It simplifies things to have a microwave that just knows it’s a microwave. This will be a bit obscure, but it’s a little like the toaster on Red Dwarf…too much intelligence might not be the best thing. I actually wrote a paper in high school called “Optimum IQ”, which addressed this same issue. I think we’ll see more of this: dedicated Alexa-controlled devices, which don’t do most of the Alexa functions. I should point out that it would only pair with something that had the word “Echo” in it…Echo Show, Echo (tower), Echo Dot…it wouldn’t pair with our Fire TV Cube, even though the Cube can do weather, time, and so on. As to the set up…what I had to do was easy, but it didn’t work at first. It didn’t show up in my Alexa app until I restarted my phone. That might confuse some people, but hopefully, it was just a fluke. Overall? Well worth the sixty dollars! I think the microwave would have been worth that without Alexa, but Alexa really makes it fun, and yes, easier. If you are still looking for a gift for somebody who already has Alexa as part of their household, this is a good choice. I probably wouldn’t get this even paired with a Dot (they sell them that way, as a bundle) as someone’s first Alexa device…I think they would focus on it too much as a microwave, and not realize everything else Alexa can do. There is something else I should mention, although we won’t use it…it can automatically reorder microwave popcorn for you, if you want. That might be more useful in the future for us if we could tell it what inventory we wanted it to manage. It would count how many times we cooked a particular item, and reorder it before we ran out. Update: I used the buttons this morning (my Significant Other was still asleep, so that’s easier) and was very impressed with the button programming! Maybe that’s just because our other microwave was older, and maybe they all do this now, but I loved that I didn’t have to push a button first to tell it I was going to cook. I was putting in twenty seconds (heating a low carb tortilla). I pushed the 2 (without pushing another button first) and it showed me two minutes. When I pushed the 0, it went right to 20 seconds. Three button pushes (not counting opening the door) to microwave for 20 seconds (2, 0, Start)…nice! for $1.99. That’s a great deal! Do you have questions or comments? Feel free to share them with me and my readers by commenting on this post. ***The microwave does tell you what time it is: it has a clock. 😉 That’s actually a nice thing…it sets itself, and will adjust for Daylight Savings Time (taking the time from the Alexa device, which takes it from the cloud. You can pre-order today with a release date of November 7th…and as low as $129.99. It has Bluetooth for Audible books, comes with twice the storage, and (I’ll have to check the terms) six months of Kindle Unlimited for free. Amazon does announce things throughout the year, but September is a special time. While they didn’t announce a home robot (they could still do that this year…it probably deserves its own event), they did announce a whole slew of new products and features. It’s funny, but when I was hearing about possible new models, I thought this one wouldn’t interest me that much. Not because I didn’t think I would want to use Alexa in the car, but because I already do…in the Alexa app on my Galaxy phone. However, we are only allowed to do a one-tap operation in California when we are driving. I can just drive with the app open and then tap the mic to talk to it, but I don’t want to have to look at the phone to do that. This device is really just a way to access the app on my phone…it does need both of those. What it will do is give me an eight-mic array designed to hear me in the car. It’s going to have access to apps, including Google Maps, Apple Maps, and Waze…and it will be able to control my home devices. You can also listen to podcasts, like Len Edgerly’s The Kindle Chronicles. Full disclosure: I’ve appeared on The Kindle Chronicles, but I don’t know Len outside of our Kindle coverage (which has extended to XR…virtual/augmented/mixed/merged reality). It will also take advantage of one of Alexa’s new abilities: location-based routines. You can ask for nearby gas stations…and it can direct you there. All of this is cool, but one of the things that convinced me? It’s $24.99! That’s 50% off what will be the price. It’s supposed to come out later this year. This one also requires a Fire TV (“or compatible mobile device”) and an HDTV antenna. I already have both, but I’m not springing for this now. What does it do? It records TV and plays it back…you know, like a VHS machine. 😉 It actually does a lot more than that, but that’s the heart of it. The less expensive model can record two shows at one, the more expensive one can record four. I think that’s going to be seen as a luxury, but will have some gift value at the holidays. They’ve upgraded the Dot and the Show, and added a bunch of things to give you better sound. Things have also gotten a bit more out there. Not only can you give it voice commands to set the time, it can also automatically reorder popcorn using Dash button tech. 🙂 You also won’t be telling it just things like, “Level 3 for two minutes”…it will have presets, so you can say things like, “Reheat coffee”. It’s an Alexa accessory…it doesn’t have Alexa built into it, you use it with an Alexa device. The same thing is true for the new Echo Wall Clock, which will display your timers counting down. That’s just the beginning! Amazon recently made it easier to add Alexa to gadgets, and the ones that they’ve told us about include a new version of Big Mouth Billy Bass…that will “lip sync” while Alexa talks. You’ll be able to whisper to Alexa…and Alexa will whisper back! You can whisper now, but Alexa responds full voice. This will be a lot better when I’m up and my Significant Other isn’t. There’s a lot more (Amazon put out four press releases today), but I’m just out of time. Did something else stand out to you? Do you have questions? Feel free to let me and my readers know by commenting on this post…and I’ll keep my eye out for that robot! Ah, September! Back to school, the new TV season, and the return of NFL football games! Well, those may be pretty fuzzy times now…new TV shows debut almost all year long, back to school sales certainly start before September, and…well, I don’t pay that much attention to the NFL**. 😉 Hm…I think I’m safe to say that September is when Halloween decorations appear in the stores (I’ve seen ’em), but that may start in August or earlier. Wowsers! Amazon just blew the doors off with new devices and features! Pre-order right now for October 4th release, and at time of writing, you can get the tablet and the dock for $94.99 at time of writing. Without the dock, it’s $79.99…the same price as the entry-level Kindle! I’m really tempted, although for me, it would be a bit redundant. Echo Show (at AmazonSmile: benefit a non-profit of your choice by shopping*). You can buy the Show right now for $129.99…$100 off. Honestly, it seems to me like the Fire HD8 is going to be better for most people. While the camera on the Show is considerably better, and the microphones to hear you are probably better, the ability to make an unplugged video call on a tablet sized device could be really big. It’s also worth noting that the new HD8 has expandable memory: up to 400GB with a micro SD slot. While the tablets have had Alexa before, this joins the Fire HD10 with hands-free Alexa. I do think it’s a significant update…but I think the big announcement is yet to come. to stick around. I love having one on my desk at work…it’s an unobtrusive videoscreen (about the size of a Magic 8 Ball). Maybe new features and a lower price, but still there. is sort of like that, at least if you stick it magnetically to a refrigerator, but because it has a scanner also, it’s bigger than what I’m thinking. I’m picturing something a centimeter/half an inch thick at most, and not always listening. You tap it to interact with Alexa…if you want hands-free, you could yell to one of your other devices. Use in the bathroom could be part of the marketing…I don’t have an Echo device there (although I do have a waterproof Bluetooth speaker I like a lot, pairing it with an Echo Dot in the bedroom…my model is no longer available). I mentioned something quite small last year…a key fob sort of thing, but some sort of wearable (headphones or otherwise) also seems like a possibility. Alexa in the car will also become more available (mostly through integration with the car manufacturers), but I can still see an add-on device (like GPS used to be) for all cars. I’m having a hard time seeing something revolutionary in the EBR (E-Book Reader) line…the Kindle. More waterproof models? Sure. Color? Seems unlikely…I’m not sure why. Could a Kindle go under $50? Yes, but there is some advantage in having it seen as a luxury item, even at the lowest price. They have an inexpensive way for you to read e-books…the Fire tablets, which are now cheaper than Kindles. We really may hear about a revolutionary home robot product from Amazon. It might not be released until 2019, but pre-orders could get it into this holiday shopping season, and it might be limited to Prime members at first. Otherwise, what we are seeing is Amazon spreading its presence (particularly through Alexa) deeper into other people’s hardware. Amazon doesn’t need to make phones or TVs if they can be on them and let somebody else take the risk on the hardware. Am I backing off an XR (Augmented/Virtual/Mixed/Merged Reality) device? Something at some point seems necessary (even though I can now see Amazon Prime Video in XR), but it may be a question of an Alexa experience in XR, and again, piggybacking on other people’s devices. Those are a few ideas. What do you think? What new hardware/announcements would you expect to see from Amazon this year? What things would you like to see? Feel free to tell me and my readers what you think by commenting on this post. arrived at the Amazon Locker today! While the Echo Show is my favorite Echo device currently, it is kind of clunky…reminiscent in that way of the first generation Kindle, even having somewhat of a wedge shape. I traveled with the Show to a family wedding so one of my relatives with a mobility issue could “attend”, but it wasn’t that easy. Yes, the screen is much smaller than the Show, and the sound is not as good to my ear (but it does do Bluetooth and line out). There are also more settings in the Alexa App (on your phone). You can do everything you can do with Alexa devices generally. Watching a video on it is…like watching a video on a phone. It’s doable, just depends on your taste for that. Where I expect it to perhaps shine at work is bringing it to meetings so a remote person can attend on it. It will fit in my laptop case (although it’s fair to say that I do use a relatively large one). Set up was easy, but updating took more than ten minutes. One thing is that it didn’t know my wi-fi password: that seems pretty random to me as to when a new device knows the one I’ve stored with Amazon and when it doesn’t. There are three physical buttons on the top: volume down, deafen (turn off the microphone), and volume up. At $129, there may not be massive adoption. However, if it got down to $50, I think we’d see homes with several of these as a video intercom system, and more commercial uses as well. There might be one in each hospital room, for example…allowing guests to visit remotely. Bottom line: my feeling is that it will become a daily part of my life at work, but that at this price, it won’t be a big hit right away. It’s certainly possible that it will take some market share away from the Show. One other interesting thing that happened recently: I went to send something to the Amazon Locker we usually use…and got a message that the locker was full! That’s never happened before. Hello, future! So many Amazon announcements! Just this week, Amazon has announced a number of updates and new directions. back in 2011…but rarely have we seen so many initiatives touted in so short a period of time. This certainly has some direct impact on Fire tablet users, among others. Unfortunately, the biggest news around Amazon Video lately has been the number of executives leaving. That, in itself, can be seen as a sign of innovation, or at least, reinvention. We don’t know yet what it will mean in the long run, but Amazon is certainly always willing to make changes. have been a big part of the Kindleer community for a long time now (the Kindle apps for the iPhone and iPod touch were announced on March 4, 2009). It wouldn’t surprise me if more e-books are read in the apps (if we include tablets, certainly) than on Kindle EBRs (E-Book Readers). This update is largely focused on social elements…but only if you have an Apple device (for now). Those features are coming to Android as well. Amazon is really, really trying to socialize their business…they do quite well with business to business, and with consumers. Nowadays, though, you also need to be part of your customers’ lives even when they aren’t shopping or consuming content. Alexa has done a lot of that: I interact with Amazon devices throughout the day, when I’m not shopping. This is far from Amazon’s first attempt at socialization; will this be the one that really catches on? We’ll see, but it is always good to see Amazon making an effort. Basically, this is Amazon Prime in bulk for businesses. It can be a huge savings: Up to 100 users are $1,299 dollars a year…that’s only $12.99 per person, potentially. There is a $499 level for up to 10 people, and $10,099 for more than 100. I think this is a very smart move, and will really make Amazon an indispensable part of the infrastructure for many mid to large size businesses. The actual implementation is quite fascinating! It’s only available to Amazon Prime members, first off. You buy a kit which has a SmartLock and a camera. If you are handy (we aren’t) you can install it yourself, or you can schedule free installation. It’s a lot more robust than just a simple lockbox and key. You can watch deliveries (live or recorded). You can unlock it remotely to let guests enter. “Happiness” is guaranteed. There are some limitations as to what can be delivered (fifty pound limit, for one). *In-home delivery is currently only available in select areas, requires an Amazon Key In-Home Kit, and is exclusive to Prime members. We definitely want this (we’ve had Amazon items stolen), but it is a lot of money in our current circumstances. We’ll think about it. The Amazon Locker isn’t far away from where we work or live…although this is more convenient, and has those other advantages. There will be a lot of questions…our now adult kid brought up hackability…but I can’t imagine it’s easier to hack this than to kick in a door (which we’ve had happen…well, we don’t know if it was a kick, but a door on the side of the house was broken to gain entry). Still, this is a big deal! I also wonder if law enforcement and first responders will have access…that could be literally lifesaving, but many might object depending on the parameters. This is about buying the Amazon Cloud Cam separately from Amazon Key (it’s included, otherwise). What do you think? I’m sure I’ll write more about these topics going forward, but feel free to ask/tell me and my readers by commenting on this post. which they have tied into the 10th anniversary of the announcement of the Kindle (November 19th). I didn’t have much time to look at it when it was announced this week…things have been busy. This weekend, I may be going up to Santa Rosa to help. My company has been considerably affected (as have family, friends, and coworkers). They are asking us to be available to support, so I’m not quite sure what my weekend will be like yet. I live about an hour away, and the air quality has been unhealthy here…we can see the smoke around us, and the sun has looked like it was red. I wore a mask walking from my car to where I was working (a few long blocks) yesterday…that was much better. The first morning of the fires, one of our dogs was quite concerned…I first thought there might be a fire in our neighborhood. It’s definitely a difficult situation, so I was happy to volunteer in what small way I can. My Significant Other is an insurance claims manager, and has been dealing with the impact as well. The first thing I did was search the document for “text-to-speech” and variations. That’s a big issue for me, as regular readers know. I didn’t find anything on it, even though it does Audible books (an Amazon company which does audiobooks). Note that there are no onboard speakers: you connect it via Bluetooth to an external speaker. However, I did get good news! I chatted with Amazon help, and they confirmed (quickly, easily, definitively) that the new EBR (E-Book Reader) does have TTS! Me: Does the new Kindle Oasis do text-to-speech? Nagaranjan: Hello, my name is Nagaranjan. I’m here to help you today. Nagaranjan: I will be glad to help you with information regarding the new Kindle Oasis device. Yes, Bufo. This device does support text-to-speech. Me: Oh, great! Not Audible books, but text-to-speech? It doesn’t say that in the Quick Start Guide. Nagaranjan: You can be rest assured about it. Other than audible books , it does support text-to-speech as well. Me: No, that was it. I use TTS extensively. I could Bluetooth it to a speaker to hear it…no onboard speakers on the new Oasis, right? Nagaranjan: Yes, Bufo. Bluetooth speakers is the only option available for this device. Me: That’s what I thought…thanks so much for your answers! Great news! For years now, I’ve been doing TTS on my now discontinued Kindle Fire HDX 7″tablet…but having it on an EBR (E-Book Reader) is a terrific option. Anyway, it has a 7″ (17.8cm) display, rather than the 6″ that almost all Kindles have had (except the Kindle DX, which had 9.7″). The 7″ size has been good for me…it still fits in my voluminous pockets, and I can hold it comfortably. The variation in depth will probably depend on the connectivity you select. You can get it with wi-fi only, or with wi-fi and cellular connectivity. My guess is the additional “antenna” will increase the depth. Do you care about cellular? It’s mostly for downloading books, I’d say, but it could also be for things like Wikipedia look up. It does cost an additional $50, and isn’t available in all configurations right now (actually, for pre-order for Halloween, at least on the main configs…maybe all). Just kidding…the original Kindle was $399, and you can pay more than that, by the time you get a cover (the K1 came with a cover). Of course, you get a lot, lot more than you did with that one, but a line graph of the most expensive Kindles over time would show a remarkable boomerang…but the least expensive would have dropped over time. Hm…might not be more if you didn’t get the cellular connectivity, but the K1 had that. Why spend more? You are often in places where there is no wi-fi. I think that is becoming more unusual for many parts of the country…hard for me to imagine that, in my normal routine, I’d ever be away from wi-fi for more than a few hours, but certainly, that’s different in different parts of the country. Why pay more? You don’t want to see ads. I always get Special Offers…I don’t mind advertisers subsiding my purchase to puts ads on the sleep screen (and this one has a banner at the bottom of the homescreen, too). They don’t bother me, and I have bought some things that way. In addition to those, you may certainly want some accessories. I read with my Kindles in a cover…a non-animal leather, water resistant cover (an official one from Amazon) is $44.99, and comes in three colors. The animal leather one (which may not be waterproof) is $59.99, and comes in three different colors (not the same as the fabric one’s colors). A wall charger is $19.99…it comes with a USB charger, which will be slower. They do have a bundle for $309.97 at time of writing, which includes the KO2, a cover, and a charger. They talk quite a bit about storing your wi-fi password at Amazon, if want…I think this is a great feature, not new to this device! Me: How many font sizes does the new Kindle Oasis 2 have? Vijay: Hello, my name is Vijay. I’m here to help you today. Vijay: Glad to meet you, please allow me a minute, Bufo. Vijay: The font size options range from approximately 8-point size to 36-point size. Me: Thanks! Do you know how many options there are? Vijay: May I know the options you are referring to ? Me: Sure. The font sizes range from 8 to 36, but I assume I can’t pick one for each point (8, 9, 10). If could pick, say, 8, 12, 16, 20, 24, 28, 32, or 36, that would be eight options. Vijay: Thanks for the information. I’m checking this for you. Yes, you are correct, the selection will be like 8, 12, 16, 20, 24, 28, 32. Me: That answers it, then…looks like 7 options. Thanks! ​Is there anything else I can do for you today? Vijay: Thank you for contacting Amazon Kindle support. Have a great weekend! You can click the *End Chat* button on the top right corner of this window to properly close the chat. Hope that helps you make your decision! If you have additional comments or questions, let me and my readers know by commenting on this post. Bonus deal: the Echo Show (at AmazonSmile: benefit a non-profit of your choice by shopping*) is $30 off making it just under $200. Speculation has been that it might be because we still haven’t seen the return of YouTube videos. “Wowsers”, of course, was an expression used by Inspector Gadget…which may be singularly appropriate here. 🙂 Amazon doesn’t like to call them gadgets any more, they are “devices”. That makes sense, since some of these are actually practical, or at least can be. With what was announced today in a surprise hardware announcement (which also had an important feature improvement), had one of the biggest line-up changes I’ve seen. It required Amazon sending out three press releases today. Oh, and they had a fourth one, that BMW and MINI will have Alexa in the car starting in mid-2018 in the USA, UK, and Germany. I think there will actually be a lot more later this year…it wouldn’t surprise me at all if they tie something big into the 10th anniversary of the release of the Kindle November 20th (I’m working on something as well)…that may be why there wasn’t an update to the Kindle EBRs (E-Book Readers) today, but it may also be why we didn’t get Amazon auggies (Augmented/Virtual Reality hardware)…they may think of that as another revolutionary item, like the Kindle. They announced new (and very different) Echo items, and a new Fire TV (as I’ve been saying they would, based on rumors). However, there were new features, too. There is a lot to digest, and there may end up being more than one post…but let’s dive in! What is it? A smaller, less expensive version of the Echo Show (at AmazonSmile: benefit a non-profit of your choice by shopping*). That means it is an Alexa-enabled speaker with a screen. Voice-enabled, and you can make videocalls to people with Echo Spot, Echo Show…or the free Alexa App on a SmartPhone. Having a small, always available screen is going to make it a big part of people’s lives…not just as a baby monitor or to watch the dogs (it does do the “drop in” feature). However, and this is new, you can now voice call anyone (they do need a phone, but not an Echo) hands free. You can speak their phone numbers if they aren’t in your contacts. This will work with most North American phone numbers (although not 911). What does it cost to call? Yes, this means free phone calling to just about any phone number. Oh, and you have the choice to anonymize the call…not show your number, but that’s up to you. To be clear, you are not using your phone to make the call. Obviously, it would be good to be able to call 911 hands-free, especially for people with some challenges. That one is $34.99, due to be released December 13th (the Echo Spot is scheduled for release December 19th). It connects to your phone number, so you can call any number you can call with your phone…911, international numbers, and so on. There are two more big Echo devices…and then a raft of features I still need to discuss! The Echo Tower has been redesigned, and the price has been reduced to $99.99! There are new colors and new finishes, including an Oak Finish. New speaker tech, new microphone tech, beamforming technology, it’s only about six inches tall, and controls hundreds of devices. However, in the past, controlling SmartHome devices also meant you had a separate hub. Now, for the last big Echo device, you can get an Echo…with a built-in hub! For $149.99, you’ll be able to control your SmartHome devices easily…oh, and they throw in (gently, I’m sure) Silver+Philips Hue Bulb (which is only available for a limited time…$14.99 value). I think this may make some people into SmartHome people who have been afraid to try it. There are two new features which will also work with the earlier generation (although they don’t mention the Tap) and the Dot, Show, and Plus. Not right away, though…they say next month. This lets you group activities into one name…and you can invoke it by voice or by time of day and dat of the week. So, when you usually get up, Alexa can already have the coffeemaker going, start your music, turn on the lights in the bathroom and kitchen, and so on. Hmm…they don’t mention it playing a particular song, but you can see how that could be great…you could say, “That’s what I’m talking about!” and have a triumphant, stadium ready anthem play, lights flash on and off. There are a lot of possibilities. This is another giant improvement! You can now assign lights (for example) to a given Echo device. That means that you walk into the kitchen (where you have an Echo), say, “Alexa, turn on the lights,” and just the lights in the kitchen come on. One more Alexa thing, and this really may add a new dimension. At this point, you are just signing up to be in the loop. What they show us as representative is basically a set of trivia game buzzers. You’ll be able to get two of those for $19.99. My guess is, though, that we’ll start seeing things like wands you can wave to “cast spells”. I’m signing up, and I’ll keep you informed. Whew! That’s enough Echo for this post! Now it has 4K Ultra HD video (and it’s a bargain for that, at $69.99). It’s got more memory, HDR (High Dynamic Range, better voice control, a slim design (which can hang and hide between the TV)…it goes on. I think the Echo Spot will be perhaps the most popular item out of this list, but the Echo TV will continue to be popular. but I’ll have to double-check. What do you think of these announcements? Feel free to let me and my readers know by commenting on this post.